Like all countries, France has its share of poor people. The poor, like the rich, still need to eat. Unlike the rich, access to food for the poor is not always easy. A recent French study has highlighted how, while most of us do our shopping in the supermarket, plenty of people gather their food outside the store. Tapping into a cultural reference, these people who forage through whatever is discarded by stores or outdoor markets are known as les glaneurs modernes (the modern gleaners). The word “gleaner” became a cultural benchmark as a result of a well-known 1867 painting by Jean-François Millet, Les Glaneuses. Millet depicted the plight of people reduced to scouring the fields after a harvest, hopeful of picking up usable grain that was left behind. The study released just last month described the profile of the new, urban, gleaners. One surprising result of the survey: it is not only the homeless who forage through refuse. There is now also another group, actually more prominent, those who have a regular residence. Unlike the homeless, who tend to consume what they scavenge right away, these domiciled gleaners, take the food home, as they would groceries from a supermarket. The extent of how the practice of gleaning went well beyond the ultra-poor was one shocking result of the study. The new gleaners are sort of caught in a difficult in-between. They are neither poor enough to receive regular food subsidies nor well-off enough to do their food procuring as a market transaction. A whole culture has apparently emerged as the new gleaners become regulars at certain sites. Grocery store operators and trash collectors come to know them and often provide tips about recuperating prize material among the refuse. So prominent is the new gleaner movement that not only have their been news stories about them, but, one of the remaining New Wave filmmakers, Agnes Varda has made a documentary about the practice. A new wrinkle to urban gleaning has recently been added. This comes via a movement that originated in the U.S. One recent news story featured well-off young professionals on their way to a local outdoor market. Unlike most market goers, they timed their arrival to coincide with the market’s closing. Why? They planned to sort through the garbage. This time the foraging is not undertaken for financial reasons. It is now a matter of ideology. Reacting to the waste engendered by a consumer society, these green gleaners forage as a way of establishing an alternative model of consumption. They seek a return to a simpler, less wasteful lifestyle. In the U.S., this movement goes by the name “freegan”. Here in France, they call themselves “freegan” (any Americanism is welcome, even by those who oppose the great giant of consumerist excess) or gratuivores (free eaters). They are also referred to as déchétariens, “trashitarians” we might say. 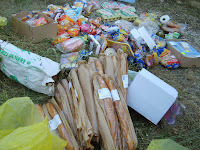 Some get a bit carried away in their exuberance, claiming, as one web site does, that “nothing is really healthier than dining on food from trash: free food for the taking, reduction of waste, and immonuvolution.” This last, strange, word indicates the surprising health benefits of ingesting food that may be a bit spoiled. Immonuvolution even comes with a snappy slogan: “Mildew, it’s loaded with vitamins." What happens when freegan gleaners, homeless gleaners, and urban poor gleaners congregate on the same spot? Hopefully the freegan gleaners decide that, maybe this once, being a standard grocery store consumer offers the nobler path.